Wow, I've been busy and still have a few custom orders to finish this week for Valentine's Day. As promised, here are the Thinking of You cards; part of the 25 cards custom order which will be shipping out in the next day or so. I've surprised myself with how many cards I can actually get done if I put my mind to it; and I think I'd like to duplicate some of these cards and put in my shop eventually. This was a nice change from snowflakes and I haven't worked on cards in quite awhile so it has been fun to work on something different. 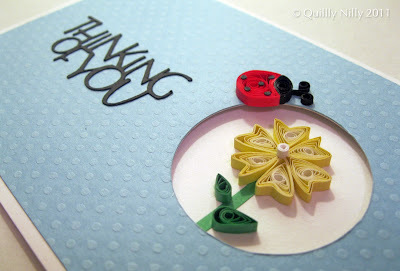 such pretty cards =) the ladybug is really cute. I agree...very pretty cards. I love the shapes punched out with quilling inside. I left something for you on my blog! Please go take a look! 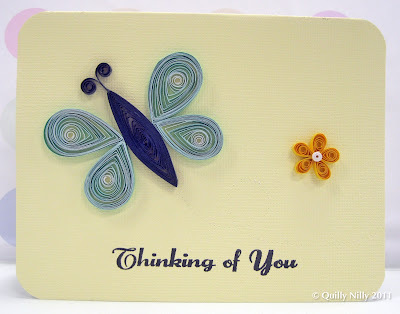 I like the cards that use only a small component made by quilling.